Four groups of fumaroles were observed in a crater, breached to the SE, during a 14 January overflight. The elongated 6 x 13 km island of Rasshua in the central Kuriles contains three overlapping central cones within a 6 km caldera whose eastern margin is beyond the shoreline. An eroded central cone was constructed during the late Pleistocene, along with an isolated cone near the NW coast. Two Holocene cones were built within the crater of the central cone. The westernmost forms the 956 m high point of the island and is the source of lava flows that flooded the crater floor and descended to the coast. The easternmost cone, active during historical time, is truncated by a 500-m-wide crater that is breached to the SE. This crater may have formed during a violent eruption in 1846. The only other known historical eruption produced weak explosions in 1957. Fumarolic activity continues in the eastern crater and in the saddle between the two summit cones. 1846 Unknown Confirmed 3 Historical Observations Eastern cone ? There is no Deformation History data available for Rasshua. There is no Emissions History data available for Rasshua. 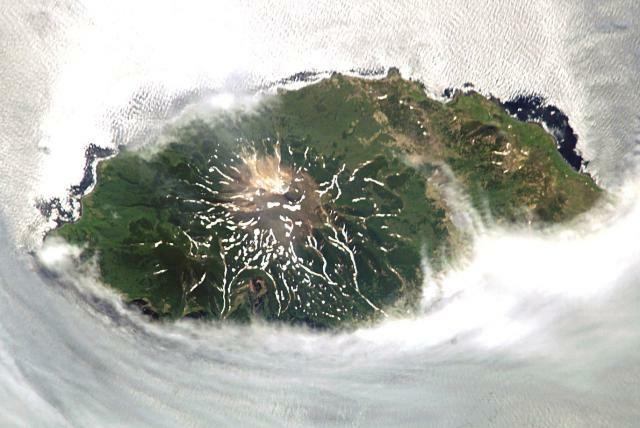 Clouds surround the elongated 6 x 13 km island of Rasshua in the central Kurils in this Space Shuttle image (with north to the lower left). The island contains overlapping central cones within a 6-km-wide caldera that cuts the northern and southern parts of the island and whose eastern margin is beyond the shoreline. The unvegetated central cone complex (left-center) is capped by two Holocene cones. The westernmost forms the 956 m high point of the island, and the easternmost has been active during historical time. NASA Space Shuttle image ISS005-E-6023, 2002 (http://eol.jsc.nasa.gov/). There are no samples for Rasshua in the Smithsonian's NMNH Department of Mineral Sciences Rock and Ore collection. Large Eruptions of Rasshua Information about large Quaternary eruptions (VEI >= 4) is cataloged in the Large Magnitude Explosive Volcanic Eruptions (LaMEVE) database of the Volcano Global Risk Identification and Analysis Project (VOGRIPA).